Had a very busy long weekend and managed to finish the firmware and host software needed for printing gcode files. One of the outcomes of this weekend was that I removed the DLL containing the official firmware. A bug in Microsoft's deployment code results in problems if you try to link a C++/STL DLL to a C# WPF application. As it turns out, the only thing I was really using the official firmware for was gcode parsing, and since there are only a dozen or so codes actually used by RepRap it only took an hour or so to replace it with a few dozen lines of C# Regex code. I stopped the print after the first layer. 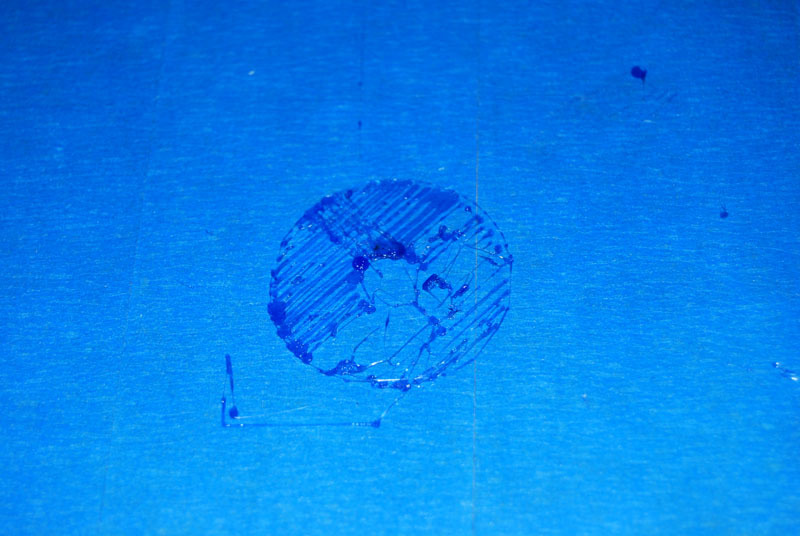 The lower-right half of the piece printed first and it was pretty obvious that there was a problem with the extruder. For the upper-left half of the piece I was manually pushing the plastic rod through the extruder, so it would seem that the extruder isn't gripping the plastic rod anywhere near tight enough. It might be because I'm not using the proper metal insert, or it might be because the springs are too weak, or possibly the mechanism hasn't been tightened enough. On the plus side, it looks like the extruder was physically moving around correctly, which is an encouraging indication that my custom Repic electronics is working correctly and therefore a cheap and viable alternative. I rebuilt the extruder last night and was getting much better results by the end of it, but there's still a fair amount of fine-tuning to do before I'm printing properly. 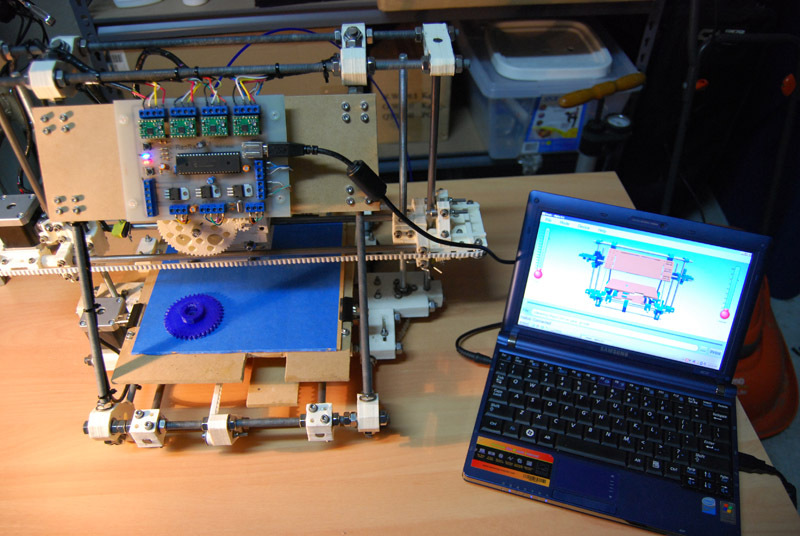 I'll be uploading all my latest code to the RepRap site tonight. The PIC24FJ64GB002 looks good but the 21 IO pin count won't be enough for RepRap + heatbed + SPI/SD so you'll probably need to either use a shift register or pull a few tricks with discrete components to increase the effective pin count. Ah, ok. My thinking was be 8 pins for steppers, 3 for endstops (min only), 2 for extruder thermistor/control, 2 for heatbed thermistor/control, 2 for USB and 1 for a LED. That would still leave 1 pin spare for maybe a program button or something? How are you planning on wiring 3 endstops to a single I/O pin? Wire them in parallel and home the carriage one axis at a time? Yes, I figure homing one axis at a time should be enough. And by wiring three, normally closed, switches (or optical equivalent) in series this should be fine and would provide an orientable failsafe for all axis. As for the max endstops, I thought it to be useful also for calibration, it would allow the firmware to figure out the total number of steps for each axis by itself. i am having an issue downloading the updated firmware from this location http://www.ppl-pilot.com/files/Repic0.2.zip has it been uploaded yet? Sorry ostamo1, the link is fixed now. Let me know if there are any problems.